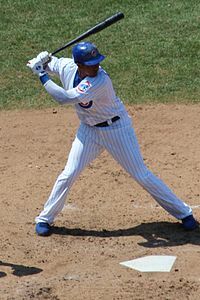 Starlin Castro play of the day! Yunel Escobar who doubled in each of the series' first two games, is 7 for 19 off Hughes. Colby Rasmus, who hit his 17th homer Saturday and is batting .417 over his last 16 games with nine doubles. Starlin Castro went 3 for 3 with a home run off Lincecum in that meeting, giving him seven hits and five RBIs in 16 career at-bats in this matchup. He's also 12 for 28 (.429) with two homers against the Giants this season. Brian Dozier continued his hot hitting against the Mariners (49-55) with a solo homer Saturday. The second baseman is 8 for 25 (.320) with two home runs and four RBIs in six meetings this season. Troy Tulowitzki is batting .400 with three homers and seven RBIs against Milwaukee this season after going 3 for 4 with a solo homer and an RBI single Saturday. Yonder Alonso had three hits and four RBIs on Saturday, raising his career average at Chase Field to .404 with 17 RBIs in 14 games. The first baseman -- 3 for 7 against Corbin -- is batting .382 with nine RBIs in nine games since the All-Star break. Matt Joyce is 5 for 13 with a double, a triple and two homers VS Hughes. Matt Wieters is hitting .378 (14 for 37) against Lester.